This section has the best tips on how to do this and that I know about. I've included tutorials for all sorts of things and there is copyright information as well. 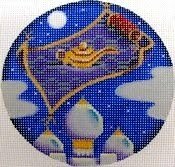 If you know of another great online source of information for needlepoint, please let me know so I can include it. The stitch used here is the Bunger Stitch, that's why Steph thanks Amy. This one will also work for water, depending on thread type and color. 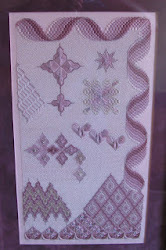 There are several articles on learning canvas embellishment on the Chilly Hollow Stitch Guides blog. Look in the various tabs under the header photo. Note that this is different than making cord (second link below). Don Lynch of Associated Talents has also used this with Flair and Petite Frosty Rays but other stitchers say to not use it with the glow-in-the-dark fibers which melt. Apparently it also works with Silken Straw. This is all hearsay, however. I have not done this myself on any threads or ribbons. For Margaret Bendig's hints, look at pp. 28-29 below. Note that the FAQ page on the ANG website is now unavailable while ANG transitions to a new website. Video showing how to work Or Nue vertically, horizontally or diagonally. Carolyn Hedge Baird maintains a photo album with hints and tricks on her official Facebook page. 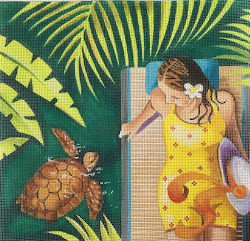 If this link doesn't work for you, log onto FB, search for Needlepointing in Your Nest--which is Carolyn's FB page--then find her photo album called "Needlepoint Knowledge." Great idea! Find something on using Sparkles from Sundanceneedlepoint.